This wonderful seaside holiday home is ideal for a short break or family holidays at any time of the year. 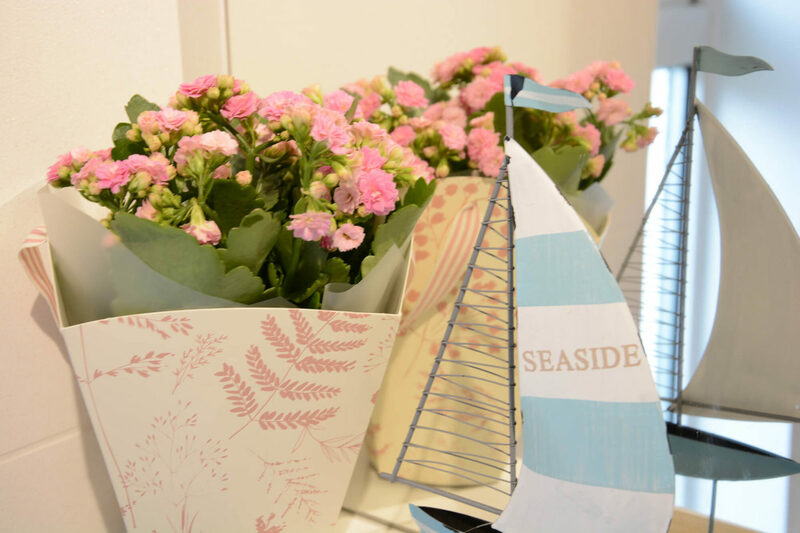 With miles of sandy beach a short walk away and lots of places to see and enjoy, The Seaside Cottage accommodates groups of up to four people on one floor very comfortably, with plenty of space inside and out for everyone to relax. 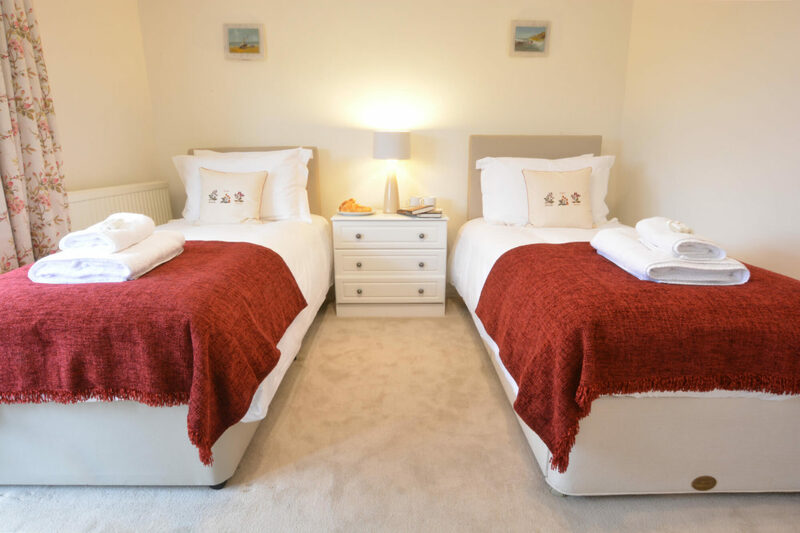 Two large bedrooms and an exceptional living space offer families and friends, a retreat with lots of activities close by. 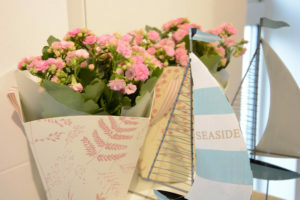 THE SEASIDE COTTAGE IS CURRENTLY HAVING A NEW KITCHEN AND UTILITY FITTED WHICH IS EXPECTED TO BE COMPLETE BY MID MARCH WHEN NEW PHOTOGRAPHS WILL BE AVAIALBLE. 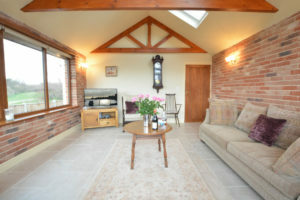 BE SURE TO BOOK YOUR FAMILY HOLIDAY AT THIS SUPER COTTAGE SOON TO AVOID DISAPPOINTMENT. You are welcomed in from the front garden with private, gated driveway into the kitchen, which leads to the central carpeted hallway. 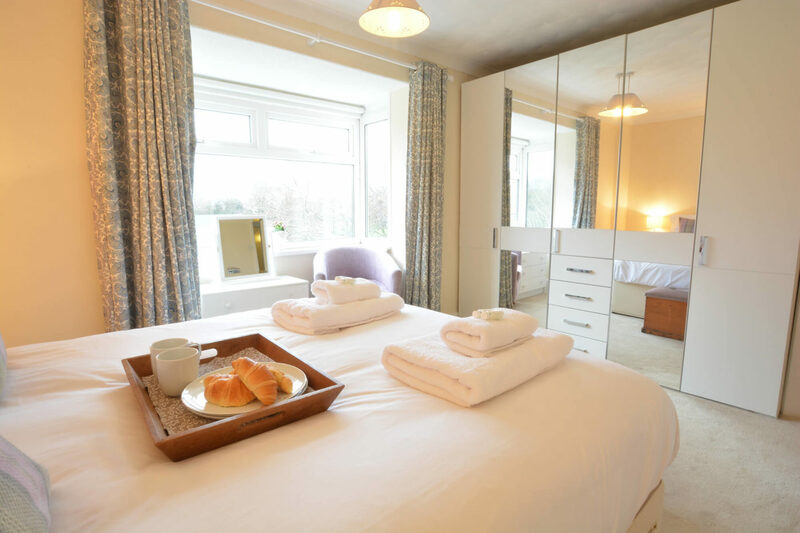 Off the hallway you’ll find the modern shower room and two bright, large bedrooms. 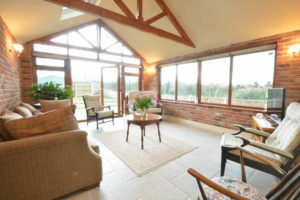 The hall leads through to the dining room and on to the dual aspect living room, with glazed double doors to the garden. This is a large bright room with vaulted ceiling and windows on two sides which overlook the playing fields and the enclosed garden. There are remote controlled electric blinds on the windows, double doors and the velux windows. 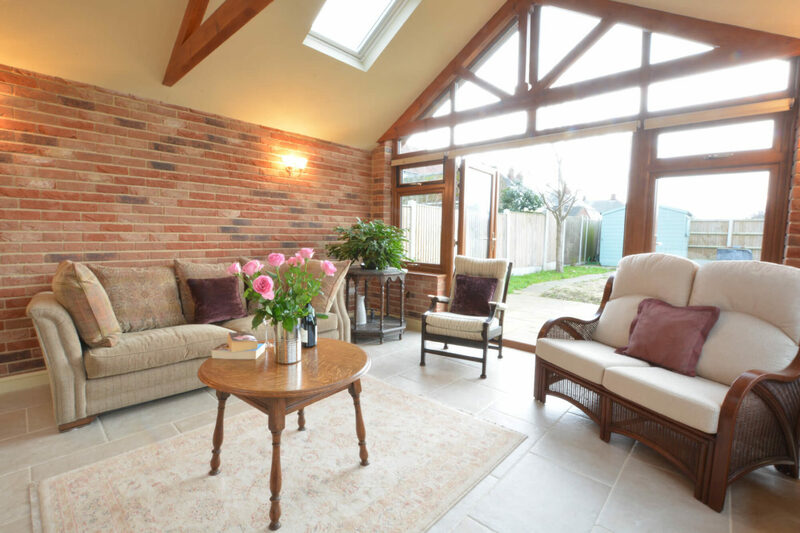 The tiled under floor heating offers warmth during the cooler months and the double doors open in the summer for alfresco dining from the bbq. Comfortably seating six, there’s a large sofa along the feature brick wall and another two seat sofa plus two arm chairs in which to relax. For entertainment there’s a smart TV and selection of books, games and DVDs. The new kitchen is currently being installed and will have a double oven at waist height, integrated fridge and dishwasher, ceramic hob with extractor above, wine rack, wooden worktops and lots of cupboard space. 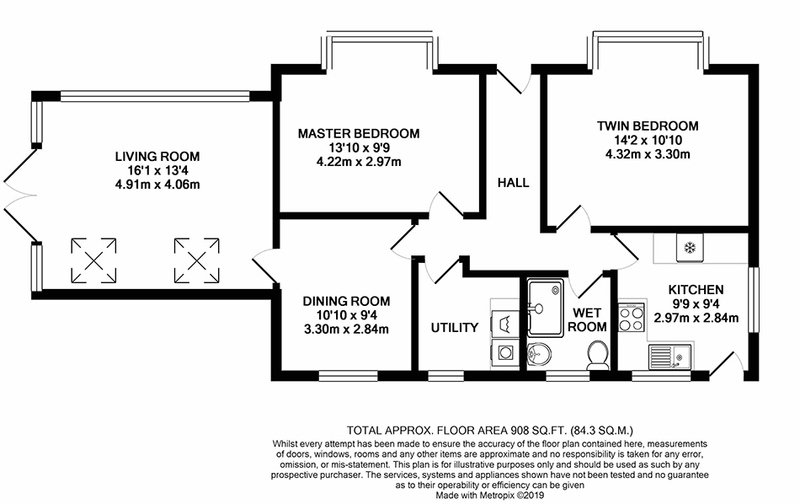 It’s a double aspect room with Karndean flooring. Also being installed at present, the utility will have Karndean flooring, a washing machine and tumble dryer, freestanding larder freezer and a sink. 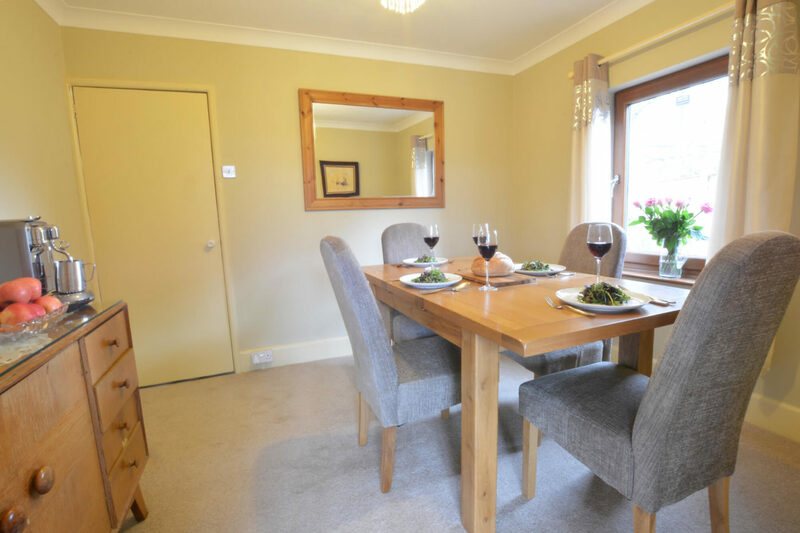 A sophisticated room with central oak table and six soft fabric, high back chairs. 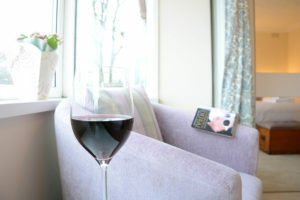 A perfectly comfortable room for socialising with family and friends whilst enjoying your meals on holiday. A sunny room with huge bay window overlooking the playing field. 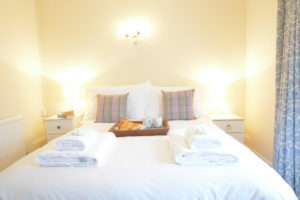 The double bed sits centrally with bedside drawers and lamps either side. There is plenty of space for your belongings in the large mirrored wardrobes with bi-folding doors and drawers in the middle. A soft chair sits beside the dressing table in the bay window, a perfect spot for reading during the day or there is an electric blind and curtains for evenings. 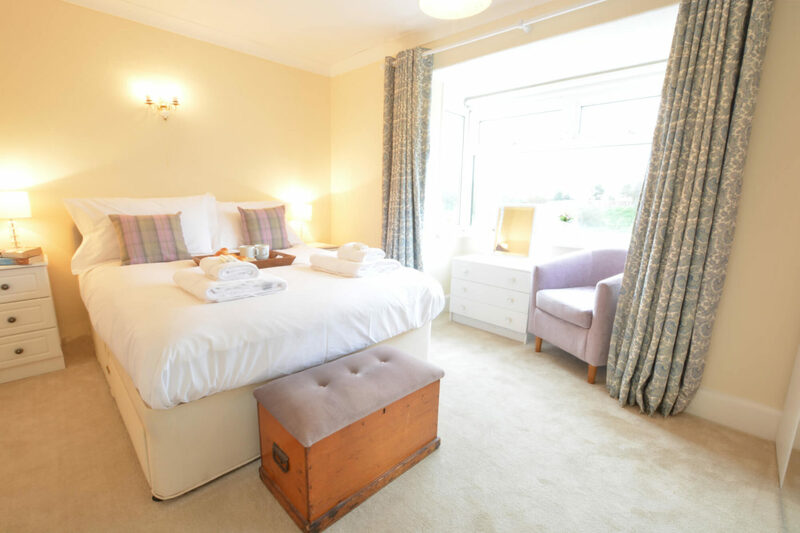 Full size twin beds are placed either side of a chest of drawers in this large bedroom. 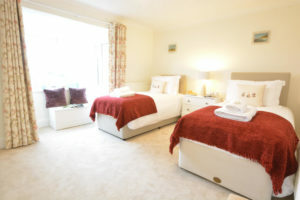 A perfect room for children or adults there’s a mirrored double wardrobe with drawers and a large chest of drawers offering ample space for your clothes. 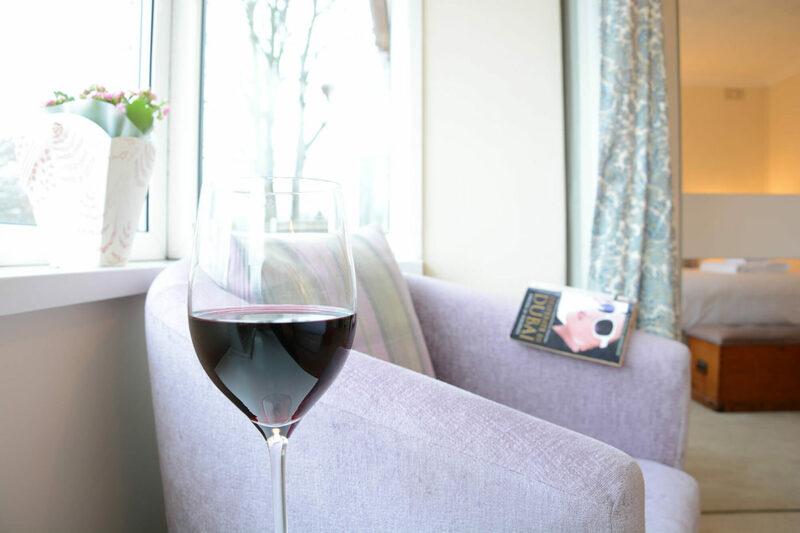 The bay window has a window seat on which to enjoy the views of the playing field. 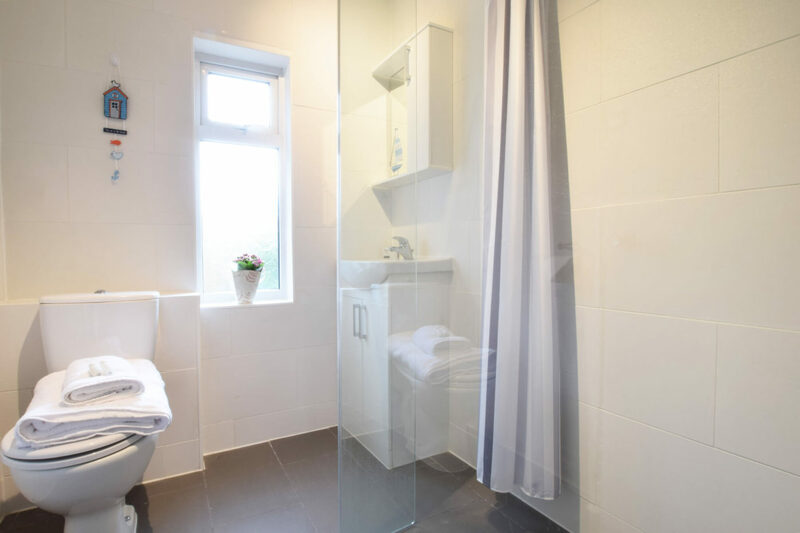 Tiled with under floor heating, the wet room has a large shower with adjustable height rose. This modern room has a WC, basin with vanity unit and heated towel rail. 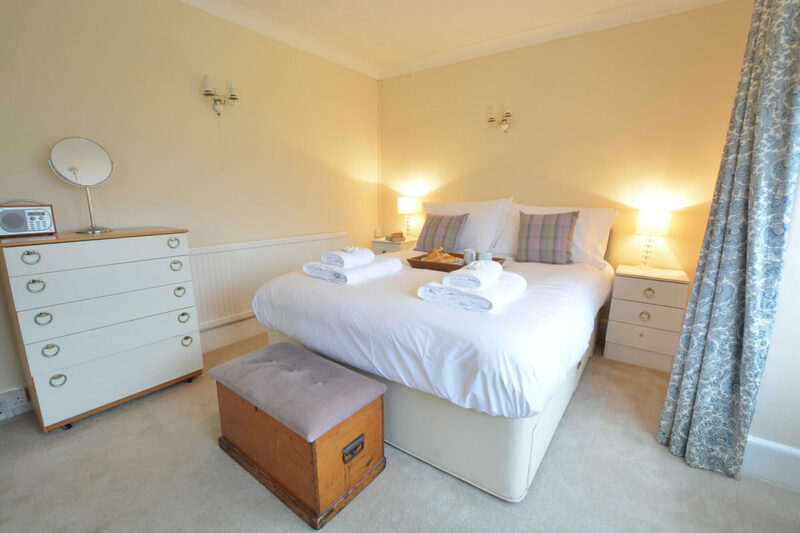 The location of this seaside cottage is just a short walk from an award winning beach. Parking for two cars is available off the road through the gates, which closes to enclose the entire garden making it very safe for children and pets. 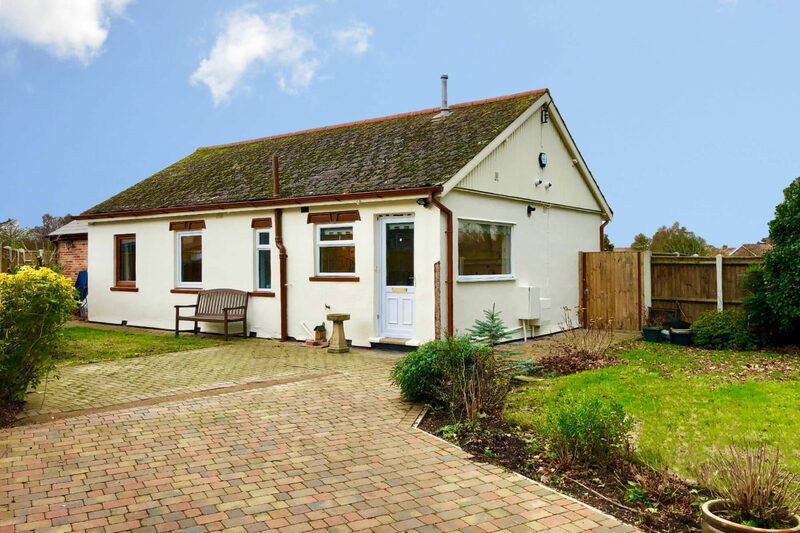 The front garden to the side of the drive is mainly laid to lawn and wraps around the house to the rear garden, where you’ll find a large patio outside the double doors from the living room. There is a lawned area leading to the garden shed which can be used to safely store bikes. Follow the garden path round to a gate on the other side of the cottage, which leads to the playing field. During the warmer months there’s a large table and six chairs with huge parasol, perfect for meals outside. 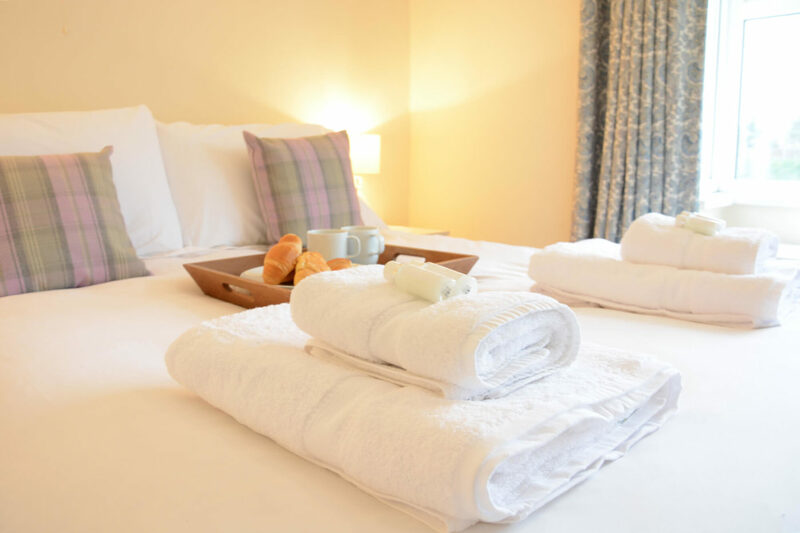 All prices include 100% cotton bed linen, towels, heating and electricity, plus a welcome bottle of wine and biscuits to help you get your break off to a relaxing start. This self-catering holiday cottage is equipped with central heating and appliances include a smart TV and Wifi. The kitchen will be well equipped with a double oven with grill, ceramic hob with extractor over, integrated fridge, dishwasher and free standing microwave. In the utility rooms there’s a washing machine with separate tumble dryer and a freestanding larder fridge. A travel cot and high chair are available from the property owners on request at the time of booking. 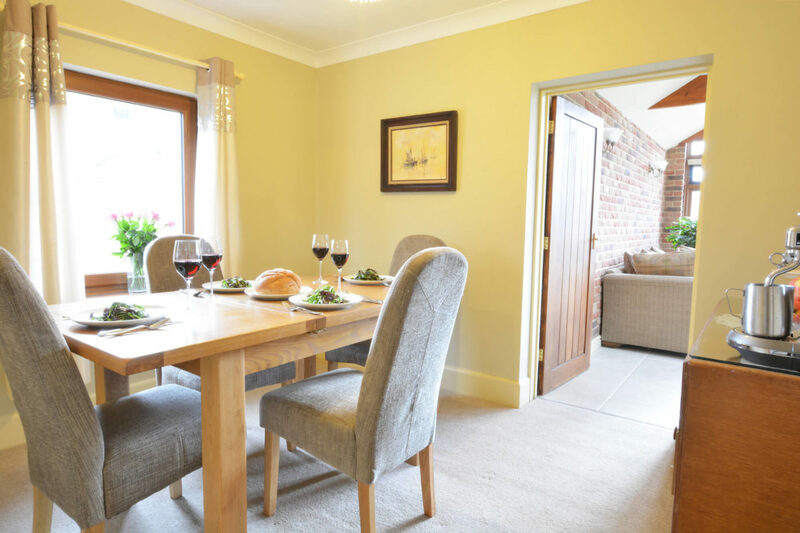 This pet-friendly Norfolk holiday house is situated in the heart of Gorleston-on-Sea, just a stones throw from the beautiful pet friendly sandy beach, which runs for three wonderful miles. 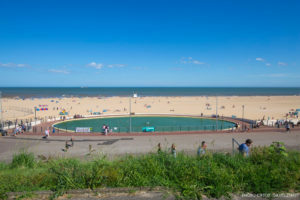 Gorleston is a seaside resort with a sandy Edwardian beach, patrolled by lifeguards in the summer months. 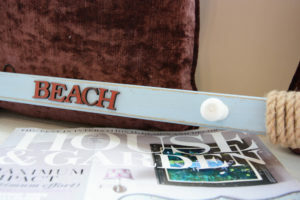 The town boasts traditional manicured gardens, idyllic tearooms, a model boating pond, Pavilion Theatre and golf club. 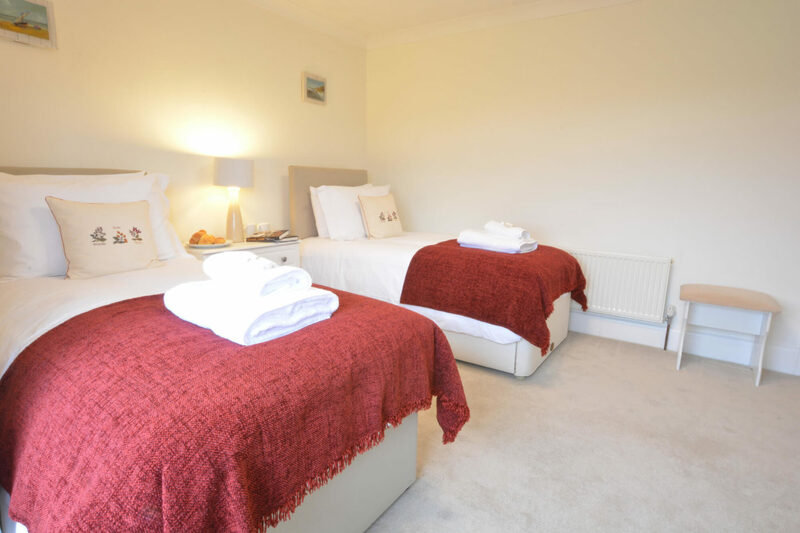 You'll find fantastic places to eat and drink including The Cliff Hotel which is just a 15 minute walk along the seawall and has stunning views across Gorleston Beach. The Splashpad is a wet play area for children to enjoy, with fountain spray and jet streams in an ocean themed play area. 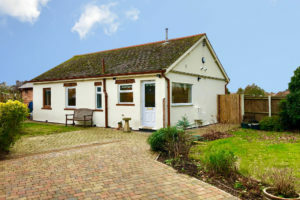 The property is in close reach of many fun filled days out. 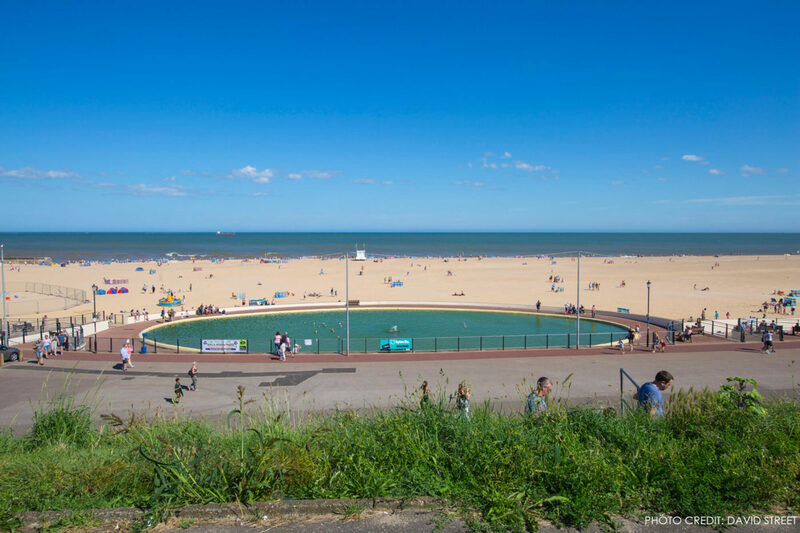 Great Yarmouth, home of the Pleasure Beach which is a free entry pleasure park, has been running since 1909 and offers an action packed day. Or visit Oulton Broad which has a number of super eateries over looking the Norfolk Broads, where you are able to experience powerboat racing and sailing. Pleasurewood Hills, a very popular theme park with over 35 rides, is only a few miles away. With rides for little children, families and thrill rides for the adrenaline junkies, Pleasurewood Hills promises an action packed outing for everyone. Another excing day out is Africa Alive. Set in 100 acres of stunning Suffolk countryside, Africa Alive has five species of African savannah animals including giraffes and lions. The park is also home to some rather amazing primates including bushbabies and the rare golden-bellied mangabeys. There are great indoor and outdoor adventure play areas as well as restaurants, free parking and a gift shop. 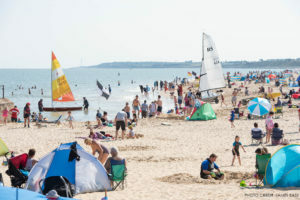 If you are visiting between November – February a trip to Horsey Beach is a must. 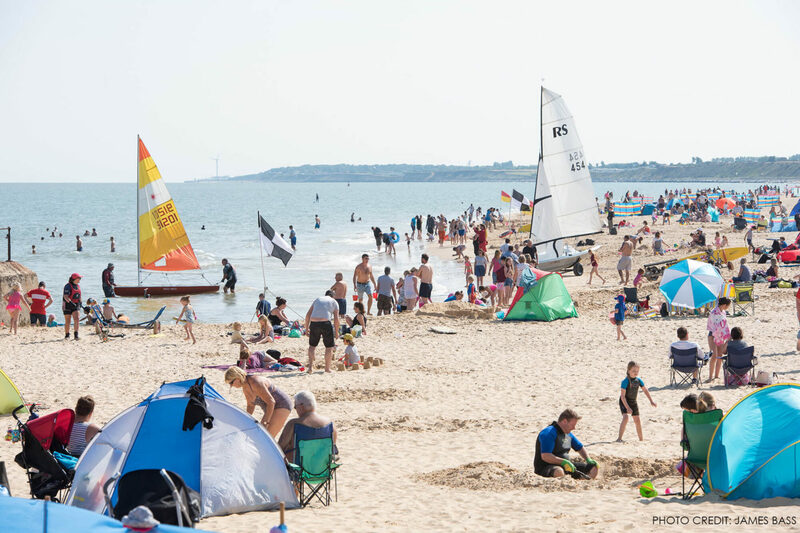 Here you can witness breathtaking views of the hundreds of grey seals filling the beach, a site that children will absolutely love to see as much as you. 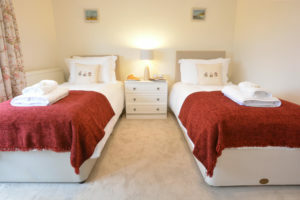 The Seaside Cottage allows up to two dogs which must be included at the time of booking on the booking form and is subject to our conditions of booking. Sorry, no smoking or unaccompanied teenagers. The Kitchen and Utility Rooms are due to to be complete by mid March 2019 when updated photographs will be available. Please contact the office if you have any quesitons about this. Once you have filled out the online booking form, you will be given the option to pay by credit or debit card, or by BACs transfer. A 25% deposit is requested at the time of your booking to secure your booking. The balance and a returnable good housekeeping deposit are due six weeks before your holiday commences. 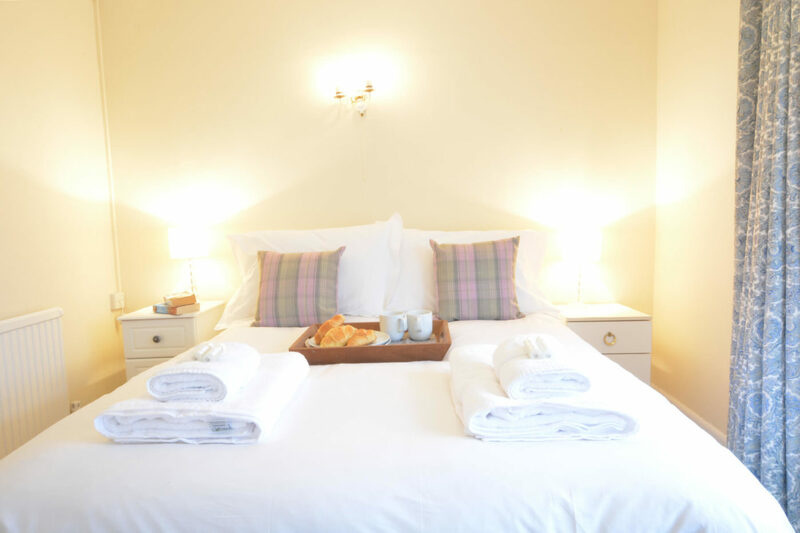 Please click here to see our full terms and conditions of booking.